Snacks are so popular in America, and for good reason. Who doesn’t love something crunch, salty, even spicy any time of day? We work long hours, get hungry, don’t have a lot of time for complete meals, etc. etc. etc. The problem with snacking is that much of the pre-packaged options are filled with too much salt and sometimes even additives that are questionable at the very least. If you can’t pronounce it or if it sounds like something that came from a chemistry lab, should you really eat it? 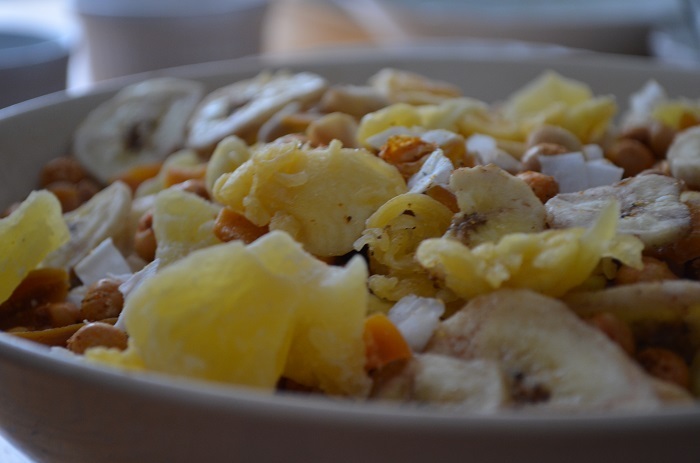 That’s why I prefer to make my own snack mixes at home, sort of like making your own granola or trail mixes. You can buy the ingredients separately then mix at will. This keeps items fresher for longer (only opening up packages when you need them), and you know exactly what’s going into your mix. 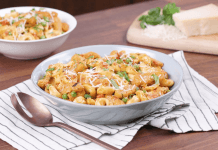 I’ve made these before, slightly different, and this is a new one I particularly love because I have been craving spicy foods a lot lately. Since recipe testing for my new cookbook (insha’Allah), my taste buds have been all over the place, but I always go back to the spicy stuff. 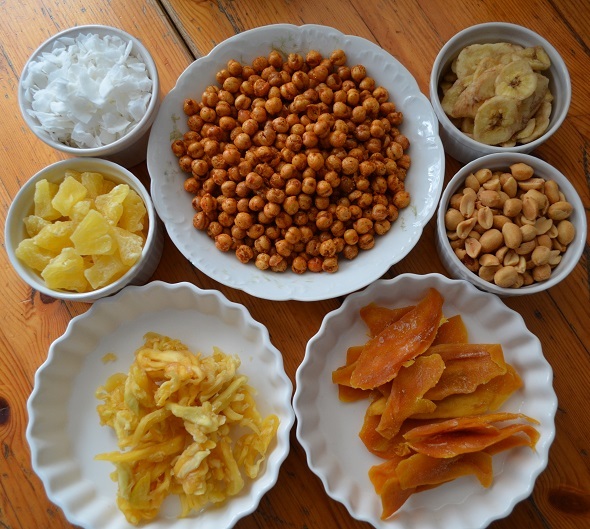 Also, dried fruits are almost always in my pantry and recently I was given two packages of dried mango from the Philippines that seemed too unique to simply eat alone. 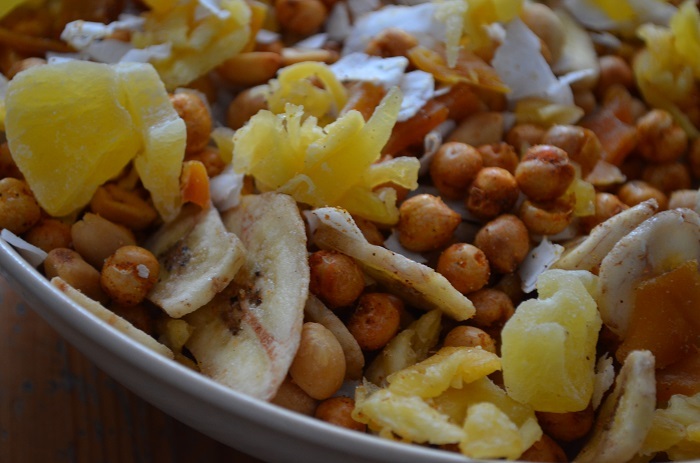 The ingredient that takes this snack mix to the next level, however, is the Bombay Spice Crunchy Chickpeas by Saffron Road. 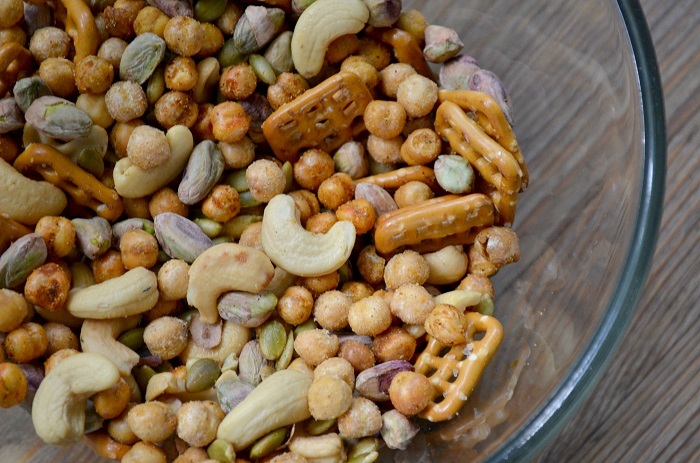 There’s simply no other snack on the market that I know of or like that is quite like it- crunchy and spicy and good enough on their own, they’re really what makes this snack mix special. 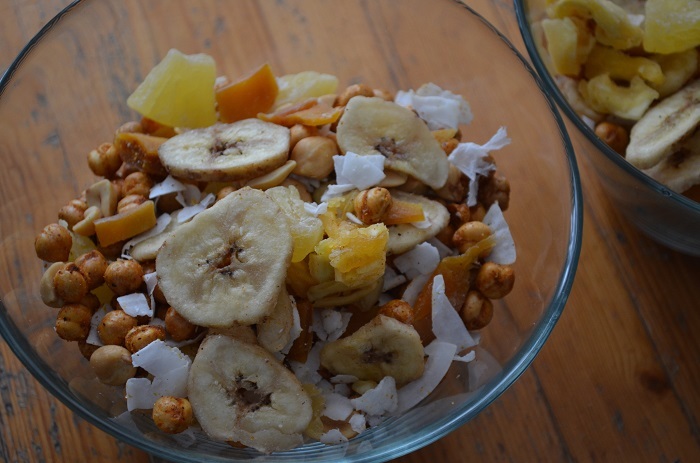 Mixed in with the sweetness of coconut, banana, mango, and pineapple and the additional salty and crunchy texture of peanuts, and you’ve got a great on–the-go snack or something you can munch on at your desk or at home. I particularly love it with a glass of tea, or some sort of Indian-spiced chai. 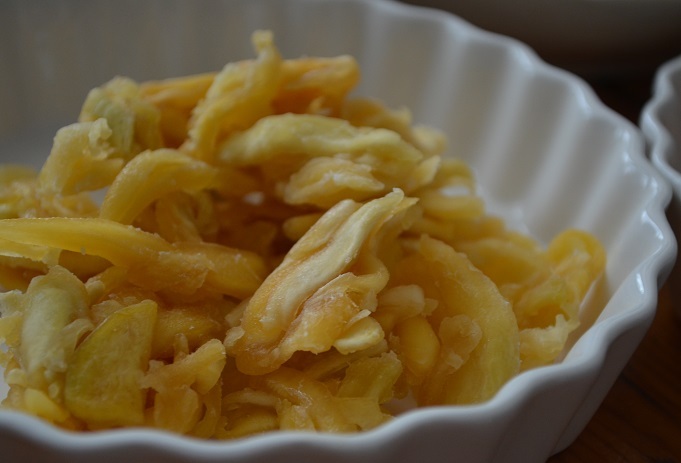 Dried mango. 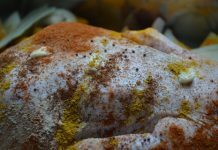 I used two types- ‘green’, which has a yellow flesh and the more common one with the deeper orange colored flesh. You can typically find these anywhere, too, but head to an Asian grocery store for some of the more interesting varieties. The ones I’m using come from Profood International, but more specifically they are Philippine mangoes. 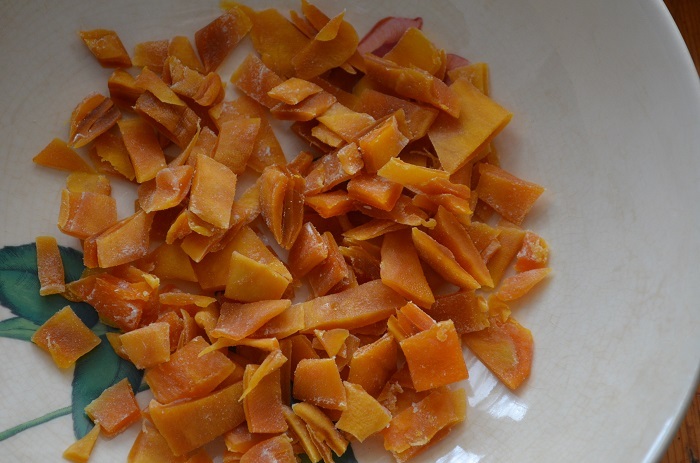 I use kitchen shears to cut both up, as the green ones are quite lumpy and the orange ones too long for this dish unless cut. These are the dried ‘green’ mangoes, which obviously look more yellow. 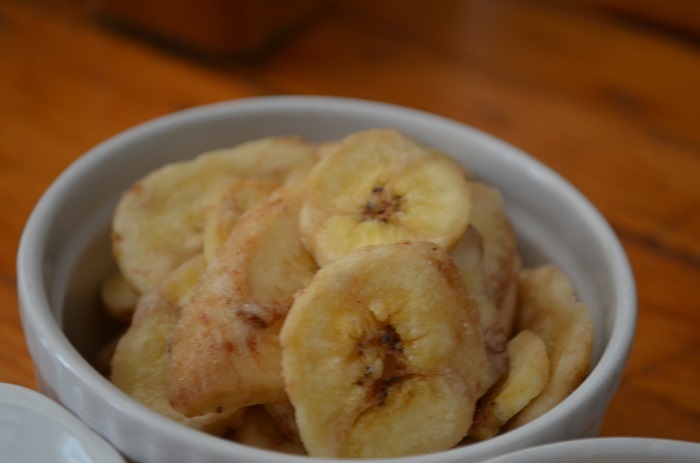 I also add dried banana- you can find these salted or unsalted, your preference. I like my snacks salty, but that’s just me. Same goes for the peanuts, if they’re salted (not pictured). 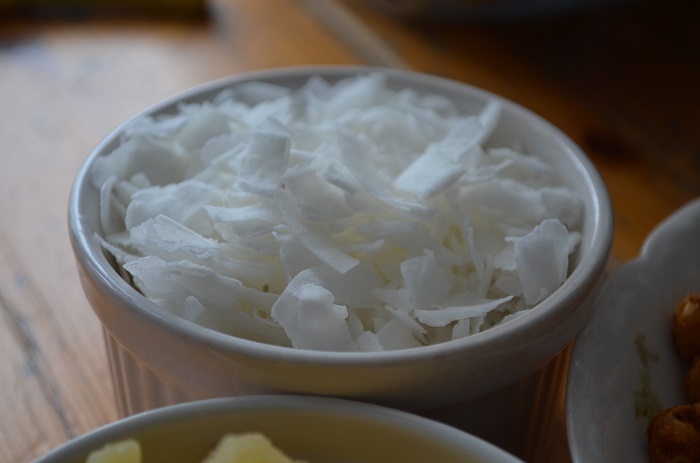 Coconut flakes are so lovely in this mix. 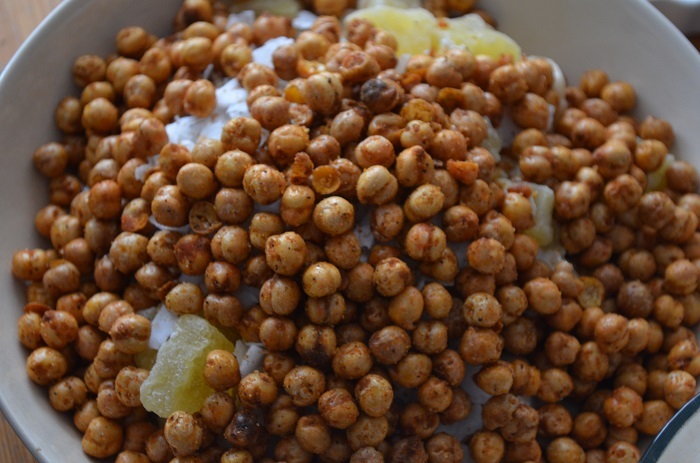 If you get the large flakes, they smell heavenly and really go incredibly well with the heat of the Bombay Spice Crunchy Chickpeas, which aren’t too hot, in my opinion. I don’t have a super high tolerance for hot foods, so I’d call the heat pretty mild in those. 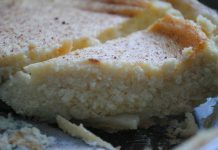 I love the softness in the texture of ‘dried’ pineapple, as the center should still be pretty chewy. 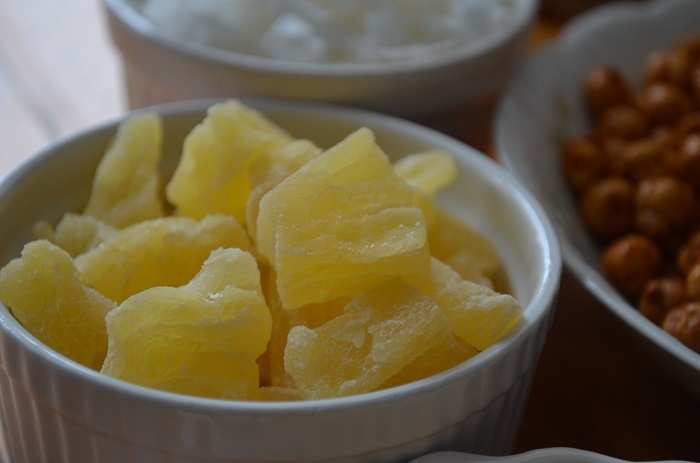 I don’t get the kind with added sugar on top, but if that’s what you like, go for the ‘candied dried pineapple’. There’s no particular order in which to mix everything together, but I like to start with the dried fruits on the bottom and put the chickpeas on top since they have all that spice and then fold it all into the rest of the ingredients- sort of like when you add blueberries to a muffin mix and you don’t want the blueberries to run through the batter, so you gently fold them into the rest. Then it should end up looking like this. You can serve in one big bowl, of course, or in several individual ones. 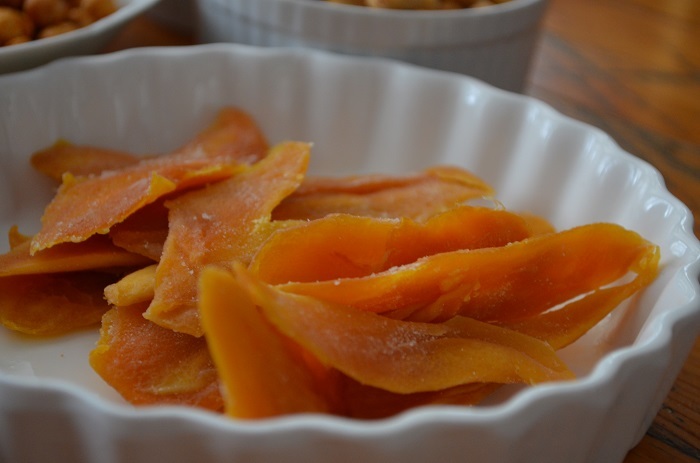 For evening or work-at-home snacks, I love to put these in small bowls for each person to enjoy. How do you like this snack idea? Is it something you would try? 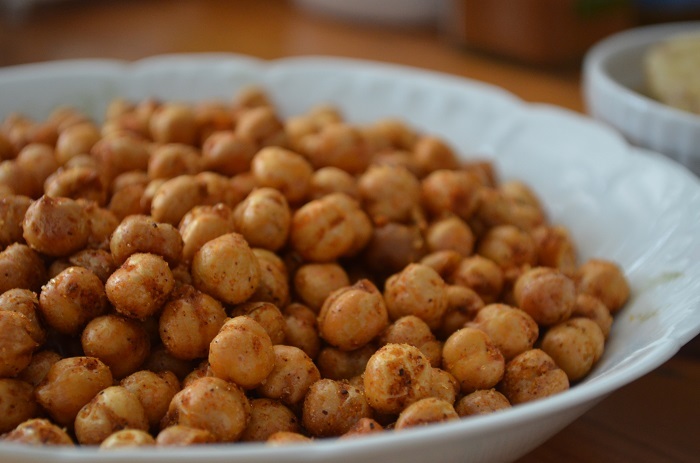 What other Saffron Road Crunchy Chickpea would you use instead, if any? *This post was sponsored by Saffron Road Food. 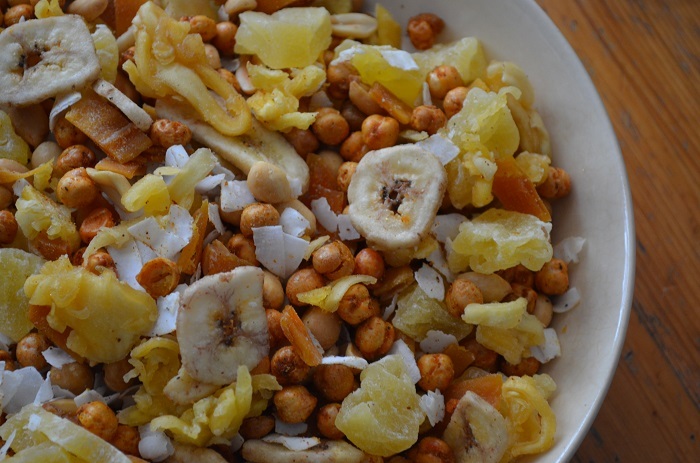 Take snack time up a notch with this mix that is full of flavors and too quick and easy not to make! In one large bowl, mix all ingredients. 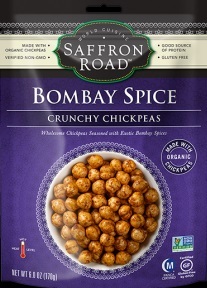 Start with the dried fruit and top with the Bombay Spice Chickpeas then gently fold in to the rest of the ingredients. 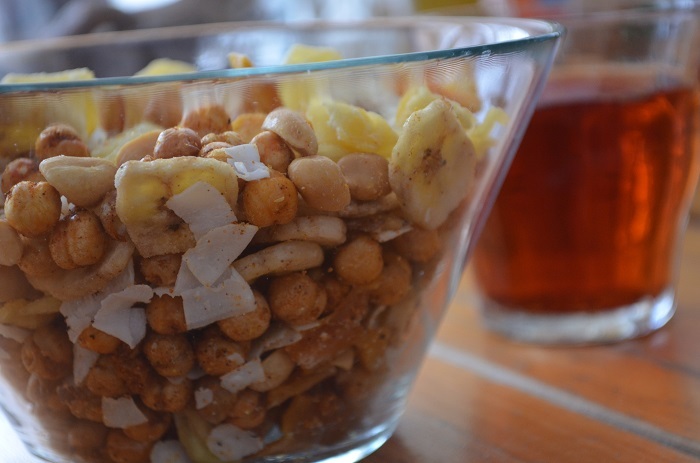 Mix and serve in one large bowl or individual bowls for easy snacking. 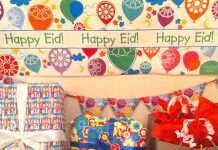 Store in a sealed bag or glass container for up to two weeks.